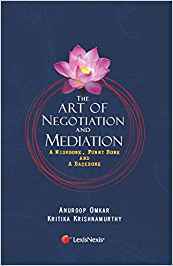 This book will introduce you to two important tools which can help prevent and manage conflicts in business and life in general – negotiation and mediation. Knowing how to negotiate helps you understand the other party’s requirements. Trying to find a middle path to meet others’ interests, while still fulfilling your own, is the first step towards building long-term personal and business relationships. But even after negotiating effectively, there will be roadblocks where we stumble and become party to a dispute. Mediation is a form of conflict resolution technique which is used all over the world to nip disagreements in the bud before they morph into all consuming, public disputes. Mediation is a technique through which disputes can be settled using limited time and finances without making your private matters public. Looking at and dealing with, not just disputes but any stressful situation differently, can change the way they affect the sum total of our life.